My SIL coming back from holiday so BIL suggest that we go airport for dinner and since I still have a $10 Changi voucher to use I have already wanted to go there to eat or maybe buy some stuffs. But they love Itacho so much they decided to dine there so we opt out going cos I cannot eat sashimi and their cook food not fantastic so I dun want to go there. Wanted to go Xin Wang but this little girl smell nice food from Poulet so she asked us to go in and eat! 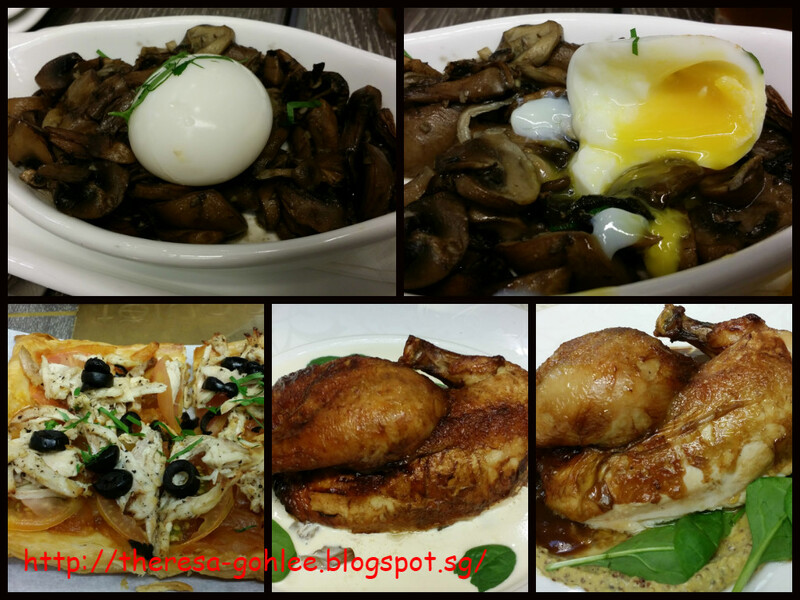 Little girl had half chicken with cranberry sauce and Goh had half chicken with button mushroom chardonnay sauce as for me I ordered Pissaladiere De Poulet - oven baked open faced pastry topped with shredded chicken and caramelised Onion jam. We also ordered sauteed wild mushroom to share as well. After having the meal we went to the arrival hall to meet up with my in laws while waiting for SIL to come out .... after they left we went to get Minnie Mouse Plush toy at $3 and this little girl say she wanna play zoomoov ..... since she had a fall yesterday we let her play 3 times which sot $10 hahaha try to make her happy! She really enjoyed very much!